Long before the advent of sport sparring and the invention of modern safety gear, in a time when to fight meant to defend one’s life from almost certain death, an ingenious method of transmitting martial arts skills from venerated master to loyal disciple was developed. Legend has it that experienced warriors returning unscathed from combat, a testimony in and of itself to their martial prowess, mimicked techniques used to vanquish multiple opponents on the field of battle for the benefit of those less qualified in the ways of war. This ritual, performed with and without weapons, may have been practiced around a campfire, in secret gardens, or in the incense-filled halls of an ancient Buddhist temple. All of which lends credence to the notion that the dynamic process of cataloging sequential packets of defensive and offensive skills through formal exercises has existed for centuries. Several examples demonstrating this concept can be traced back to antiquity with roots found in primitive works of art and ancient yogic postures originally intended to promote health and core strength in sedentary clerics. Today, poomsae, hyung, tul, kata, and taolu, all culturally specific terms for choreographed sequences of self-defense techniques aimed at defeating multiple attackers approaching from various directions, represent the cornerstone of any traditional martial art. There is a mural, discovered by archeologists in 1935, which appears on the ceiling of Muyong-chong, a royal tomb in southern Manchuria built during the Koguryo dynasty, between A.D. 3 and A.D. 427. The painting depicts two men engaged in a type of sparring activity. Generically defined as forms or formal exercises, the core patterns, which support the technical foundation of Korean taekwondo, Japanese karatedo, and the various styles of Chinese gungfu, are distilled from primitive combat elements that eventually coalesced and evolved into the subsequent predetermined routines unique to these classic martial disciplines. An illustration of this linkage, particularly as it relates to traditional taekwondo, can be found in mural paintings that appear on the ceiling of Muyong-chong, a royal tomb built between AD 3 and AD 427 during the Koguryo period (37 BC–AD 668). Discovered by archeologists in 1935, these ancient images depict two warriors engaged in a type of free sparring. While these tactics in and of themselves do not constitute the prescribed combinations of techniques that comprise forms, they do confirm the existence of an organized combat discipline unique to that time and region. Likewise, if one were to visit Sokkuram Grotto located high in the mountains of Korea surrounding the great Kyongju plain, you would witness the granite image of Sokgamoni, the grandest Buddha in all of Asia, whose presence reflects sublime beauty as he sits gazing out over the East Sea and farther on toward the rising sun and Japan. The illustrious history of this sacred site reaches back to the year AD 751 when King Gyeongdeok commissioned Prime Minister Kim Taesong, a member of the royal family, to supervise the construction of an enduring monument to the Buddhist faith. After painstaking research, he chose a site of spiritual significance high atop Mount Tohamsan situated in the heart of the Sillian capital. Here, at the eastern terminus of the Silk Road, not an hour’s walk from Bulguksa Temple, the elaborate shrine to “Buddha Land,” grew Sokkuram Grotto, a symbol regarded as a supernatural defense against external threats to the national consciousness of the kingdom. Sokkuram is an artificial cave that consists of an anteroom, an entryway, and a temple in the shape of a dome. Hundreds of granite sections of various shapes and sizes were pieced together by an ingenious method using stone rivets rather than mortar to bind them. Natural ventilation controls humidity and temperature inside the grotto. The image of Sokgamoni, positioned slightly off center in the domed temple, is chiseled from a single block of granite and stands over ten feet tall. This unusual position takes advantage of a lighting phenomenon that causes his presence to appear centered when viewed from the anteroom. With eyes partially closed, a faint smile painting his lips, the Buddha is seated in a lotus position with his right foot exposed as it lies across his left knee. The hands are set in a classic mudra, or gesture that supports enlightenment. It is clear that the gifted sculptors did not wish Sokgamoni to feel lonely during his eternal vigil through time. Surrounding him is a pantheon of lesser deities in the form of Avalokitesvara, the bodhisattva of compassion; four heavenly kings, representing the four corners of heaven, and a cadre of deva kings. But for the taekwondoist, perhaps the most significant of these images is that of Keumgang Yuksa, the stern guardian-warrior stationed at the entrance of the rotunda. Cast in bas-relief, he seems to leap out in defense against the demons that threaten the sanctity of this spiritual vortex. 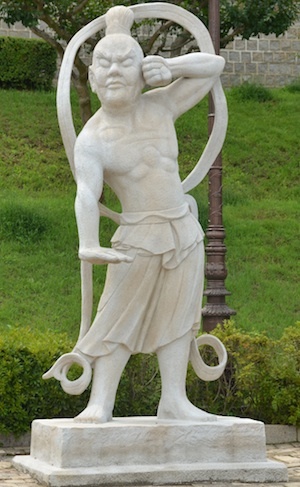 Naked to the waist, exposing a muscular torso adorned below in a flowing skirt, he was selected by Kim Taesong to defy the invisible enemies of Buddhism. Translated from Sanskrit as “diamond” or “thunderbolt,” Keumgang embodies the power of compassion yet manifests raw, physical power. It is from this potent example that taekwondo draws elements of its technical heritage. Martial arts historians trace the high block (olgool makki), palm heel strike (batang son chiki), and knife hand (sonnal) to this ancient warrior. Supported by one leg in some cases, his crane stance (hakdari sogi), too, has contributed to the defensive arsenal of taekwondo. Currently, Keumgang Yuksa is memorialized in Keumgang, a black belt poomsae inspired by his name as well as a majestic mountain range located within the borders of Korea. Featuring the diamond block (keumgang makki) and crane stance, this formal exercise emphasizes the strength of nature’s hardest substance, the diamond, in cutting through unforeseen adversity. Moreover, since Korea, the homeland of taekwondo, is no stranger to life’s struggle for survival, the philosophical component underscoring this poomsae is all the more poignant. As millions of martial artists worldwide acknowledge this faithful warrior through the practice of Keumgang poomsae, he remains unwavering, standing his eternal watch at the entrance of Sokkuram. Always the silent sentinel, it is forces unseen that he defies and defends against. Moreover, beyond the borders of Korea, within the vastness of China, lies the Shaolin Temple, widely regarded as the fountainhead of the Asian martial arts. There, in the early sixth century, formal exercises used as a vehicle for cultivating physical discipline and defensive tactics begin to materialize when we examine the life of the Zen Buddhist patriarch Bodhidharma, third son of the Brahman Indian king, Sagandha. Early references are made to Bodhidharma’s association during his youth with a warrior caste known as the Kshatriya. Through this alliance, he became schooled in the empty hand fighting art of vajramushti. It is conjectured that Bodhidharma traveled to Hunan Province in Northern China, eventually finding his way to the fabled Shaolin Temple. Upon his arrival, he discovered that the clerics inhabiting the monastery were incapable of sitting in meditation for extended periods in part due to the extremes of their environment coupled with a weakened state of mind and body. As a result, Bodhidharma initiated a series of formal exercises that came to be known as Shih Pa Lo Han Sho, or the Eighteen Hands of Lo Han. These movements were imparted with the hope of strengthening the residents’ ability to concentrate while preserving the spiritual harmony required in monastic life. Given Bodhidharma’s adherence to Buddhist doctrine, the Shih Pa Lo Han Sho routines were, in all likelihood, initially intended as a non-violent form of discipline, but may well be credited with spawning many of the taolu, kata, and poomsae prevalent today. Furthermore, since their religious ideology forbade the use of weapons, teaching the Shaolin monks how to defend themselves from wild animals and marauding bandits during their travels, both valid concerns of the day, through the use of empty hand techniques, came as a secondary benefit. It is also claimed that Bodhidharma was responsible for teaching the clerics methods to cultivate ki, the vital life force, in the form of Da Mo’s Wei Dan (Bodhidharma’s Internal Elixir). Aimed at concentrating this internal energy within specific parts of the human anatomy for martial purposes while at the same time insuring against ki blockages that can result in illness, these exercises are said to be the precursor of the routines found in modern day qigong.